Simple solar setup with Renogy 100 watt solar panel. The panel charges two 6 volt deep cycle batteries. 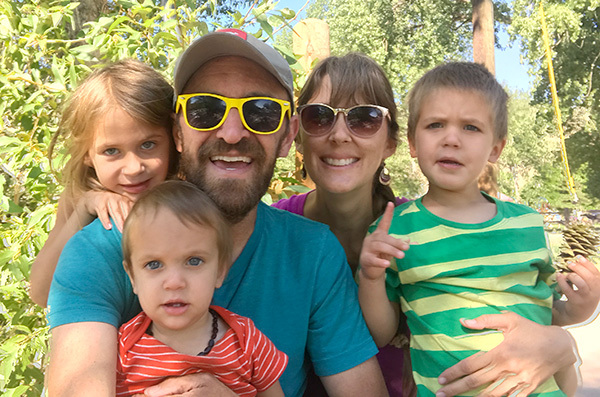 This past October our family traveled to Virginia so I could run an Ultra Marathon. 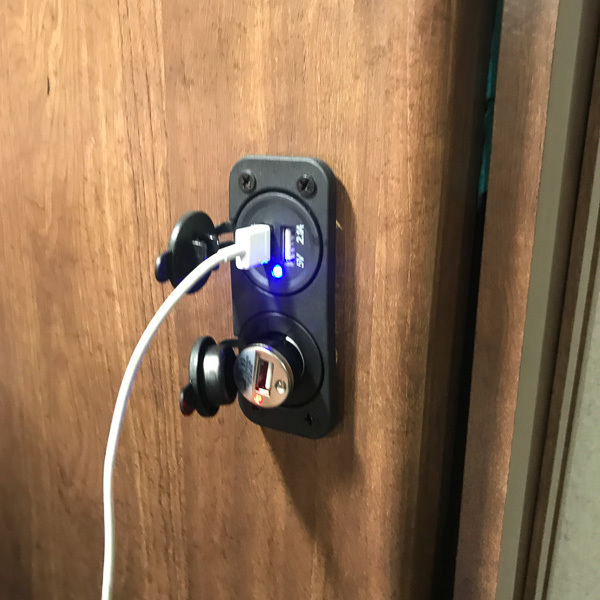 We knew it was going to require us to be without shore power in our RV for at least 3 nights (we ended up 4 nights without shore power), so I decided to research solar power. Because the last time we boondocked for several nights we used a generator and even on a fully charged factory installed battery we couldn’t make it through one night without COMPLETELY draining the battery, which I now know is a huge no-no. The first thing you need has nothing to do with solar panels. It’s a battery bank. 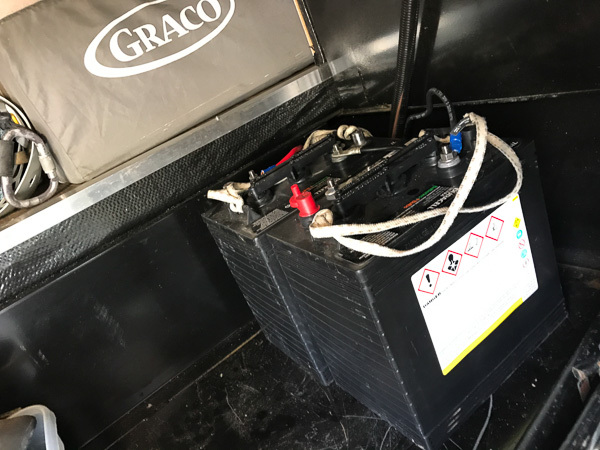 The battery your RV came with isn’t going to cut it. You need to upgrade to two 6volt deep cycle batteries. Commonly known as golf cart batteries. 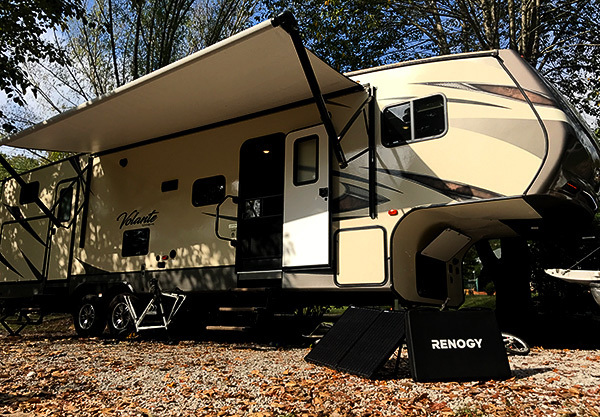 So simply put: let’s say your RV lights draw 5 amps and you ran those for 10 hours straight you will have used 50 amp hours of your 105 amp hours (this is assuming nothing else is drawing off the battery) So this is where a solar panel comes in. The solar panel keeps the battery charged so you always have usable amps. Solar panels don’t “power” your RV. They simply keep the battery charged. We use a Renogy 100 Watts 12 Volts Monocrystalline Foldable Solar Suitcase. We decided on the “ground deploy” method because we wanted simplicity and did not want to deal with installing panels on the roof or running wiring through the RV. This 100watt panel connects to our battery setup with alligator clamps and the line from the panel has a 10amp fuse installed in it. We also purchased a model that came with a charge controller which is another essential component of a solar setup. Without a charge controller the panel can’t regulate and put “juice” into the batteries. The higher the wattage panel you get the more amp hours it can pump back into the batteries. Our little 100watt panel puts in about 5 amps per hour in full direct sun. So, if we used 20 amps of power during the night running lights and fans, it would take 4 hours to fully charge the battery. So far, this simple setup has been great for us. So much so we temporarily disconnect from shore here in Austin (we went back onto shore power because the cost of propane offset any energy savings). 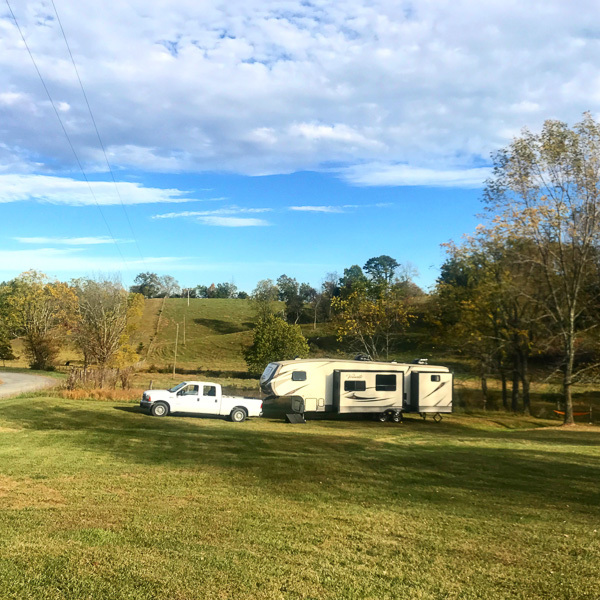 Boondocking in Virginia. We spent 4 nights completely off grid. So that’s it, a super simple way to go solar. Purchase a briefcase style solar panel WITH charge controller. Two 6 volt deep cycle batteries wired in series. We use the Duracell 120 Amp Hour Golf Cart batteries. Important things to note when going solar. This simple system will not power air conditioning, AC outlets or microwaves. The more batteries you have the more usable amp hours are available and the longer you can go without having to charge them. This is helpful for cloudy days. When on solar you are running on DC only. You will need propane to keep your fridge running. Use small 12 volt adapter inverters for charging laptops, batteries, and televisions (I will say though we don’t have a TV in our rig so have never attempted to power one). You can hard wire them to the battery or use the 12 volt outlets you installed. Going directly off the battery is always best. Never let your battery capacity fall below 50%…or 12volts. This can be measure with a voltmeter, or usage meters that connect to the battery. USB and 12 volt ports, wired directly into the existing LED lights. Wires run through inside of the closet up into the light fixture. When using two 6v batteries for a 12v output you wire the 6v batteries in series, not parallel, as you mention in your blog. The link you provide states it correctly. If you wire the two 6v batteries in parallel you get 6v out. Thanks for the catch. Got it fixed.